As much of the USA prepares for dangerously cold temperatures this week, rescue teams in Florida are starting to see the effects of low water temperatures on the state’s manatee population. Late yesterday, a 725 lb. sub-adult male manatee arrived to SeaWorld Orlando’s critical care animal hospital, suffering from symptoms of cold stress including abbesses and dehydration. The manatee was rescued in Lake Griffin in the centre of Florida by Florida Fish and Wildlife (FWC), Sea2Shore and a local chapter of the Save the Manatee Club. After a field assessment, the animal was transported to SeaWorld, where veterinarians started medical treatment and rehabilitation, including antibiotics, fluids and other supportive care. "Even in Florida, local water temperatures are starting to drop below 68 degrees Fahrenheit (20 degrees Celsius), which is the threshold for manatees to survive," explained Jon Peterson, SeaWorld Orlando's manager of rescue operations. "Manatees need warm water, and when temperatures drop, they are at a high risk of succumbing to the cold." "Our goal for this rescued manatee is to continue to rehabilitate him here at SeaWorld, and return him to the wild when water temperatures warm up," said Peterson. In 2018, the SeaWorld Rescue team assisted with a record number 72 manatees suffering from a variety of aliments including cold stress, red tide and entanglement. 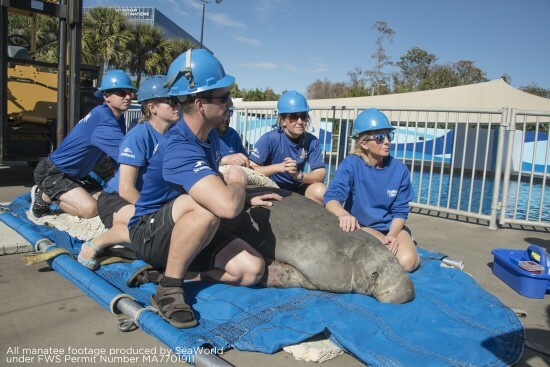 SeaWorld works with the Manatee Rescue & Rehabilitation Partnership (MRP), a cooperative group of non-profit, private, state, and federal entities who together monitor the health and survival of rehabilitated and released manatees. Great job Seaworld, pity PETA doesn’t see the good work they do.